2BR/2.5BA Home - Close to Conv.Ctr & WWII, Private & Safe, Family Friendly! The house has a spacious living room, dining room, kitchen, half bath and laundry room on the 1st floor. Two bedrooms and two full baths are upstairs, each with a queen bed. A twin size daybed is located in the master bedroom. A twin size rollaway cot as well as a queen size air mattress can also be set up to accommodate children or other guest(s) in either bedroom or the living room. The home is appointed with soft and luxurious linens and towels, a fully furnished kitchen, cable, wifi, and all the details to make your stay enjoyable. Attention Conventioneers! This home is so close to the Convention Center. You will love being a quick walk to a relaxing and comfortable home! By Google Maps calculation it is 0.6 mi walking distance to the main entrance (closer if you use one of the other entrances). Plentiful free street parking is available as well as a gated driveway. Cancellation policy: If you cancel at least 60 days in advanced, you will receive a full refund. If you cancel at least 30 days in advanced, you will receive 50% refund. Anything less than 30 days, and there will be no refunds available. We provide an independent check-in process with a coded lockbox. No need to arrange a set time to meet us but we live on the block and are available if needed! Family Friendly: Pack-and-Play, Stroller and High Chair provided in the house. Queen size air mattress and extra linens also stored in the house and available for your use. I tend to give guests their space. However, I do live in the neighborhood and am happy to stop by and meet with you or assist in any way. Please don't hesitate to reach out! 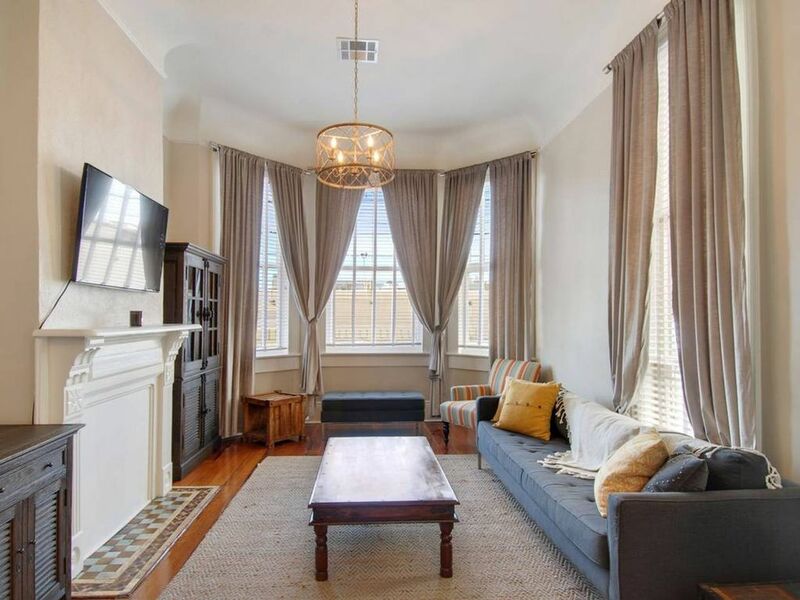 This home is in the historic Lower Garden District, renowned for important architecture and one of the oldest neighborhoods beyond the French Quarter. Recently restored to it's turn of the century beauty, you'll enjoy a home that is full of character and original details but offers all the modern amenities that create a comfortable stay. This is a prime central location within the city for visitors and business travelers alike. A few blocks walking distance to the Warehouse District as well as shops and cafes on Magazine Street. The Garden District and French Quarter are easy to reach on foot or by car/bike. Streetcar: The St. Charles Streetcar line is a short 5 blocks for the house and can take you to the French Quarter or in the other direction towards the Garden District and Uptown. The streetcar is $1.25 per person (exact change required.) You may also purchase a day pass which is $3.00 per person all you can ride. UBER / Lyft: Uber and Lyft are both great services in New Orleans. The city is geographically small, so fares are typically very affordable. Blue Bikes: New Orleans has recently launched the bike share program, Blue Bikes. There are over 70 Blue Bike stations located around the city which makes riding from one area of the city to another very convenient. The bikes costs $0.13/minute and are prorated to the minute so you are only charged for riding time. Construction Notice: There is some construction going on across the street as they build apartments. As hosts, we live on the block and are managing fine with the project as they work only during the day. This notice is meant to provide as much info as possible, especially to those who might be sensitive to increased activity or traffic in the area. Thank you. I'm Ro and I'm hosting this house for my friend Mike and live right here on the block. Travels to over 40 countries, for work and leisure, have given me an appreciation for the role a unique & thoughtful guest home plays in the travel experience. I understand the desire to soak up the local vibe of a place without sacrificing comfort and hope that you'll recognize this approach in our guest home. This home has a wonderfully elegant and yet cozy feel. It's two stories give both perfect spaces for entertaining as well as private and restful bedrooms. My friend Mike, who comes from a family of New Orleans craftsmen, completed the restoration and many of the original 19th century details were preserved adding so much character. High end appliances, luxurious bathrooms, and fine linens and furnishings make this house a one of a kind home away from home. The home features a lovely back patio and courtyard as well as off street parking. On-street parking is also uniquely easy compared with other parts of the city. Very clean, comfortable house . Easy access to street car. We had a great time and enjoyed the modern kitchen and pleasant back porch. Everthing just at pictures in advertisement. Lovely house, nicely furnished. Prop mgr helped us thru a couple minor snags. A stunning old home with modern amenities. You will be blown away. Very convenient location: 5 minute walk from the St. Charles Street car! Off street parking with gated entrance. We travelled to New Orleans to attend the Saints vs. Steelers football game, but arrived a few days early in order to enjoy the city. Upon arrival, we found the house inviting and comfortable after a long 15 hour drive. My husband, myself, and four teens were comfortable in the space. The beds were comfy and there were plenty of linens. The bathrooms were nice but the showers didn't have a lot of pressure. The location worked well with public transportation; we used the St. Charles Street car as well as the bus. We have a large SUV, so the parking was tight and difficult to get in and out of. The construction across the street did not bother us. Ro was very helpful and quick to respond. We would definitely choose this house again. Enjoy a walkable neighborhood feel with restaurants, shops and cafes lined along Magazine St. which is just one block away. The charming street car line on St Charles is a 5-10 minute walk. This is a quiet pocket of New Orleans but incredibly central to all the attractions of the Crescent City.